The Chehalis Basin Fisheries Task Force (CBFTF or "Task Force") is a private, nonprofit, tax-exempt corporation and one of fourteen Regional Fisheries Enhancement Groups (RFEG). While the Task Force functions in a variety of capacities, its main focus involves acting as a funding agency, coordinating technical resources, and providing public education. Base funding for the RFEG program comes from a grant from U. S. Fish and Wildlife Service's Partners for Fish and Wildlife Program, a portion of State commercial and recreational fishing license fees, and excess egg and carcass sales administered by WA Dept. of Fish & Wildlife. Producing salmon for sport and commercial fisheries. Enhancing steelhead and sea-run cutthroat trout resources. Restoring, enhancing, and protecting stream habitat critical to these anadromous species. The CBFTF is a non-profit organization dedicated to increasing salmonid populations for citizens and communities in the Chehalis River Basin. Satsop Springs. This WDFW rearing pond was a closed facility and not slated for further production. The Task Force, with the assistance of Grays Harbor Trout Unlimited, Grays Harbor Poggie Club, and the Elma Game Club, acquired the use of this facility and have since turned it into a model enhancement effort. Since inception, the Task Force has allocated over two million dollars to fisheries enhancement projects and over eighteen million to habitat restoration efforts. In addition to fish production and restoration projects, the Task Force constituency has initiated, educated and supported a wide variety of issues. Chehalis Basin Task Force - 25 years of action. The Chehalis River Basin Fishery Resources Study and Restoration Act allocated federal funds for the development of restoration plans within the Chehalis River system. The Conservationist of the Year Award was presented to the Task Force Board of Directors by the Northwest Steelhead and Salmon Council (Trout Unlimited) in 2000 for our dedication to the preservation of the environment and fish and wildlife. State Regional Fisheries Enhancement Groups were created in 1990 by the Washington State Legislature. Fourteen enhancement groups were established throughout the state and modeled after the CBFTF. These groups are making rapid progress in volunteer enhancement efforts in their regions. The Chehalis Basin, Water Resource Inventory Areas (WRIA) 22 and 23, is the second largest river basin in the state of Washington. It is bound on the west by the Pacific Ocean, on the east by the Deschutes River Basin, on the north by the Olympic Mountains, and on the south by the Willapa Hills and Cowlitz River Basin. Elevations vary from sea level at Grays Harbor, to 5,054 feet in the Olympic National Forest. 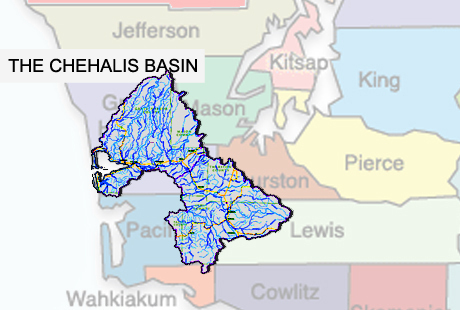 The Chehalis Basin encompasses 2,520 square miles and drains 2,660 square miles. The Chehalis River System flows through three distinct eco-regions; Cascade (including the Olympic Mountains), Puget Lowland, and Coast Range before emptying into Grays Harbor near Aberdeen. The Chehalis Basin encompasses 90% of Grays Harbor, 30% of Mason, 55% of Thurston, 50% of Lewis, and small parts of Pacific, Jefferson, Cowlitz, and Wahkiakum Counties; encompassing 1,694,951 acres. This region consists of eleven major sub-basins and a number of minor drainages and 1,391 rivers and streams containing 3,353 linear stream miles. The main-stem and South Fork Chehalis drain areas west and south of the City of Chehalis.